I'm trying to solve the mystery of a crazy high cpu usage on kernel_task. 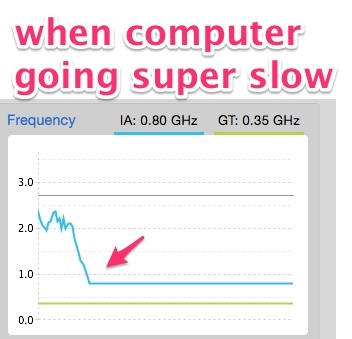 I saw some advice to download the Intel Power Gadget. That showed me that the my CPU is slowing way down. How do I fix this? When this happens, I can sometimes cycle the power on the MBP. But this is driving me crazy. Activity Monitor may show that a process named kernel_task is using a large percentage of your CPU, and during this time you may notice a lot of fan activity. This process helps manage temperature by making the CPU less available to processes that are using the CPU intensely. In other words, kernel_task responds to conditions that cause your CPU to become too hot. When the temperature decreases, kernel_task automatically reduces its activity. You might want to reset the SMC one time to be sure it's not stuck and providing incorrect temperature readings to the processor. If the SMC or high temperatures is the root cause, you should be able to correlate the various internal temperature sensors and physical measurement of the case and exhaust air temperature with the design throttling of the kernel scheduling and the clock rate adjustments the chipset is designed to make in response to thermal measurements. Worst case, you have a hardware issue with faulty temperature sensors or an out-of-spec CPU that generates more heat than it should for a given GHz clock rate. In my case, I had a MBP used continuously for 3 years. The local Mac store opened the case and cleared out the dust. That FIXED the problem!!!! Basically the extra dust caused the CPU to overheat. My current MB Pro Retina(late 2013) suffers from this. I installed Ubuntu on my laptop just so that I can barely run the browser and terminal. The reason behind my laptops throttling seems to be faulty temperature sensors. Some of the sensors are reporting a reading of -127C which starts the throttling. I have compiled temperature readings from sensors in this github gist. So far, there's no solution in sight. I have tried cleaning, modifying kernel extensions and resetting SMC. Not the answer you're looking for? Browse other questions tagged performance cpu . Why does kernel_task cpu% grow unbounded until forced reboot?